Multi-platinum rock band Shinedown will perform at Fiserv Forum on March 8, 2019, as part of its 2019 ATTENTION ATTENTION World Tour featuring support from Papa Roach and Asking Alexandria. Tickets for the show at Milwaukee’s new world-class arena will go on sale to the general public on Friday, Oct. 5, at 10 a.m. Tickets can be purchased here. Shinedown’s new single “GET UP” from their chart-topping album ATTENTION ATTENTION (Atlantic Records) has been moving listeners around the globe with its offer of hope, empathy and encouragement in the face of personal struggles, whatever they may be. 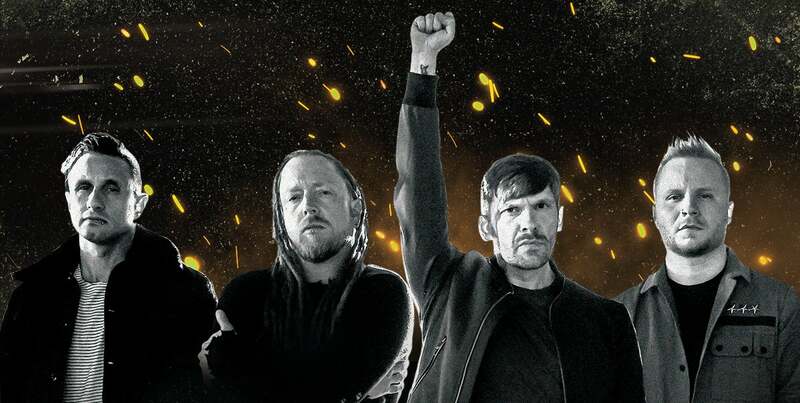 Offering a light in a time of darkness, especially with mental health issues, is something frontman Brent Smith is deeply connected to after battling his own personal demons, and “GET UP” was born out of watching his friend, Shinedown bassist Eric Bass, deal with clinical depression. When Brent put pen to paper, a beautiful, universal song rooted in Brent and Eric’s raw vulnerability took shape. Reaching far beyond any genre or label, “GET UP” speaks to the human spirit in a time of need, and it’s a song that has already resonated with the masses – becoming a fan favorite at arena shows on tour where the crowd response is palpable. It has drawn attention from the likes of Huffington Post, Salon, Buzzfeed, Parade, Grammy.com and more, has garnered more than 13 million total streams with key playlisting on Spotify and Apple Music, and is currently at Alternative Radio as well as Active Rock Radio, where it is sailing up the Top 10. Watch the video, directed by Bill Yukich (Beyonce’s Lemonade, Marilyn Manson, Wiz Khalifa). ATTENTION ATTENTION simultaneously hit No. 1 on Billboard’s Alternative, Top Rock and Hard Rock Albums Charts and debuted Top 5 on the Billboard 200 and No. 1 on iTunes. The story that unfolds as the album progresses is a poignant and enduring statement about humanity, touching on topics such as overcoming struggles, mental health, not being afraid to fail and the resolve of the human spirit as seen on tracks like the No. 1 Active Rock hit "DEVIL" (which became the band’s 12th No. 1 on Billboard’s Mainstream Rock Songs Chart - one step away from the record of most No. 1s in the history of the chart) and the anthemic "THE HUMAN RADIO". Given the deeply personal nature of the record, Shinedown went in-house for production for the first time ever, enlisting bassist Eric Bass to produce and mix the album in its entirety. Fan club pre-sale begins on Tuesday, Oct. 2, at 10 a.m. local. Citi is the official presale credit card of the Shinedown tour. As such, Citi cardmembers will have access to purchase presale tickets beginning on Tuesday, Oct. 2, at noon local time until Thursday, Oct. 4, at 10 p.m. local time through Citi’s Private Pass program. For complete presale details visit www.citiprivatepass.com. Spotify pre-sale begins Wednesday, Oct. 3, at 10 a.m. local, and radio/local pre-sales begin Thursday, Oct. 4, at 10 a.m. local.